Arizona’s Kartchner Caverns State Park will celebrate Earth Day and the return of the cave’s Myotis velifer at Bat Day on the weekend of April 18th and 19th. The event, a celebration of all things bat related, includes family activities, live animal displays by the Arizona Game & Fish Department, Huachuca Area Herpetological Association and Forever Donkeys, presentations by State Park Rangers and guest speakers as well as hands-on activities. Also featured this year is CaveSim, an electronic simulator with 60 feet (18 meters) of crawling passage and realistic cave formations that are electronically sensed to give users feedback with videogame-type scoring. This caving experience is for beginner and experienced cavers aged six and older. In addition, guided tours of the cave will be offered, however park staff recommend making early reservations to avoid being disappointed. During the summer months, the cave’s Big Room serves as a nursery for around 1,000 female cave myotis bats (Myotis velifer). Pregnant females return to Kartchner Caverns around the end of April, where they give birth to a single pup in late June. Arizona State Parks conducted several studies before development to see how the bats could be best protected. The results of the studies led Arizona State Parks to close the Big Room for tours while the bats are using it. The bat populations are monitored each summer to see that they remain stable. 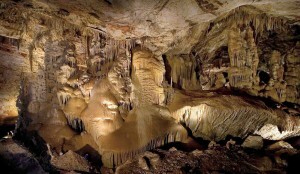 For more information call (520) 586-2283 or visit the Kartchner Caverns State Park website.